A Bit Backward . . .: We're Not in Provo Anymore, Lincoln! We're Not in Provo Anymore, Lincoln! Hello from sunny sunny Tucson! I'm typing this blog post from the U of A Library while Squire runs errands on campus. Pretty exciting! I'm really itching to do a blog post on our travels and blast this blog with pictures. Unfortunately I left our camera in the Jeep, and Lincoln and I don't feel like walking a mile in the 108 degree heat to retrieve it . . . 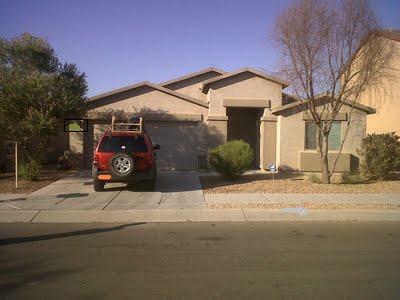 But here's a cell phone picture of our cute little rental home though! Relationship with alcohol. Both Tucson and Provo are college towns, so you have the large groups of young adults going to school. However, going to school at a private church school - the one that has been ranked stone cold sober by college Newsweek rankings for many years - is a far stretch from the self-reported U of A stat that 80% of students party one time or less a week (meaning 20% party more than one night a week -?) There are many bars close to the University, and alcohol sold in the local Sunflower market and other grocery stores as well. In Provo, there was the State liquor store and one bar on center street? Haha. A big difference. Bare skin! We Mormons like to be covered up. "Modest is hottest" is a catch phrase that gets passed around in the Mormon community. BYU girls who wear cap sleeves or skirts even an inch above the knee are considered scandalous by many. Additionally, Provo's weather never gets as hot as Tucson, so covering up just makes sense. My system has been shocked to see the tube and belly tops and short short shorts! Haha. I know it is naive of me, but I had forgotten that people exposed their legs below their knees outside the swimming pool in other parts of the country. The weather. Oh, yes the weather. It is hot here. Very very hot. It's been around 110*F each day. Provo is know for its eternal snow. Random snow storms have been know to pop up in May and June. Here, I'm pretty confident there will be no snow - ever. So, Provo friends - when you're complaining about how you hate the snow on facebook this next year, think of me and pay a nice warm visit to Tucson, alright? Baby craze. In Provo, it was not uncommon to see ten or twelve pregnant women walking around the local Costco at any given time with one, two or three children in tow. On BYU campus, babies had a noticeable presence as well. Lincoln is really really adorable, it's true, but here in Tucson he gets so much attention everywhere we go. Especially on campus. It's kind of fun! Lincoln has been enjoying his chance to flirt with cute college girls and other random people in the grocery stores around town. Plant life (and lack thereof). It's true - there really isn't a whole lot of grass out here. Rock and sand lawns abound. However, the plant life is wonderful! I've never seen so many varieties of cacti. The saguaro cacti are quite charming as well. It's almost like I've stepped in to another planet or into an aquarium of sorts. I'm totally sold on our new green - and purple - plant friends. That's all for now. We will have more updates and posts as soon as we can. We can't move in to our new place until Wednesday. We stayed in hotels a couple nights and are now staying with a very gracious family in our new ward! So, once we have internet access on our own desktop in our own home - you can expect to see a whole lot more.